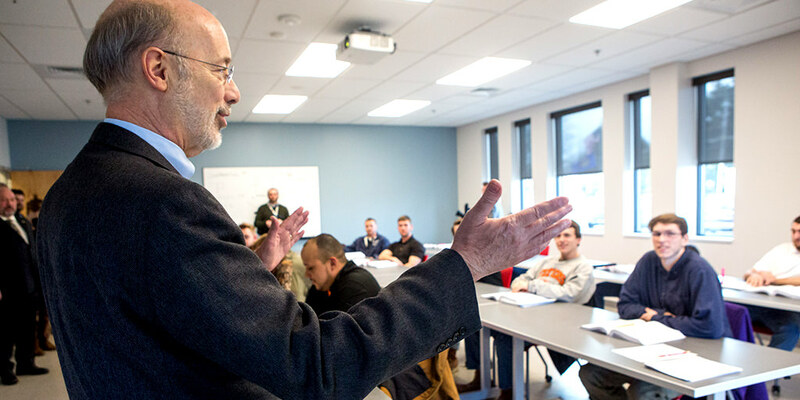 Harrisburg, PA – Today, Governor Tom Wolf announced that the Department of Labor & Industry’s Apprenticeship and Training Office (ATO) approved the addition of five new apprenticeship programs and two new apprenticeship occupations to help employers train the workers they need and assist job seekers in establishing a career pathways that lead to jobs that pay. The Wolf Administration established the ATO last year to be responsible for providing outreach, education, and technical support to current and prospective apprenticeship program sponsors and apprentices. To date, the ATO has added 1,714 new apprentices and 66 new registered apprenticeship occupations statewide. Bryn Mawr College –The college added an HVAC and plumbing trade to its existing apprenticeship training program in Bryn Mawr. Curtis Industries – Curtis Industries registered a machinist program. The company works to hire students from local career and technical education programs. Detroit Switch, Inc. – Detroit Switch manufactures high-pressure, high-shock switches for the Navy and heavy manufacturers. Detroit Switch is a small company, and registered an apprenticeship program as a pathway for a current employee to train to be a machinist. Electro Soft, Inc. – Electro Soft Inc., a 30-year veteran in electronics contract manufacturing, specializes in cable assembly, box build assembly, wire harness assembly and printed circuit board assembly. The company registered a program for industrial manufacturing technicians. Greiner Packaging, Inc. – Greiner Packaging Inc., which manufactures plastic cups, registered its existing non-registered apprenticeship training program. Students earn two-year associate degrees as part of the apprenticeship program. Philadelphia-Delaware Valley NTMA Chapter – Philadelphia-Delaware Valley NTMA Chapter added an industrial maintenance trade to its existing machinist training program. TLC Construction Co. – TLC Construction registered an apprenticeship program in construction. The company emphasizes hiring ex-offenders and others from underprivileged communities. TLC Work-Based Training, the associated non-profit organization, helps ex-offenders get credentialed training and partners with supportive services to help reduce recidivism. Approved through the Department of Labor & Industry’s Apprenticeship and Training Office, apprenticeship programs are used to provide employer-driven training to create a more productive, diverse, highly skilled workforce for employers and help reduce employee turnover. The program provides job seekers with increased skills, and a nationally recognized credential to support future career advancement and increased wages. For more information on the Apprenticeship and Training Office, visit ATO.